Our Baby Wrap Carrier is made of a light 100% cotton fabric, more suited to warmer climates, with an added extra support layer to ensure a snug fit for your baby. It is fully adjustable ensuring a perfect fit every time. 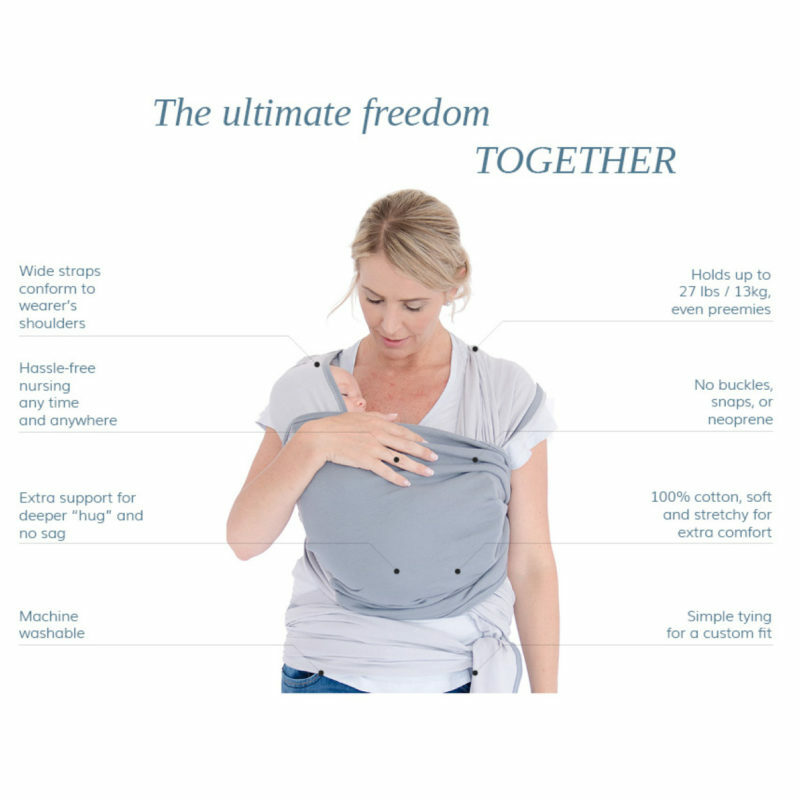 The Baby Wrap Carrier will enable you to ‘wear’ your baby without the fuss of clasps or buckles and your baby simply goes with you as you carry on with your day to day activities. It’s great to be able to wear and not wheel your baby around! The Baby Sense Baby Wrap Carrier is a versatile carrier, which is fully adjustable ensuring a perfect fit every time. This one size versatility fits all caregivers and grows with your baby, and the wide shoulder support evenly distributes weight across entire back and hips. The tapered ends make wrapping easier, there is less fabric to handle and it allows for ease of movement when wrapped. Comfortable: The Baby Wrap Carrier is comfortable and easy to wear for extended periods of time, designed to use your entire back and shoulders to hold the weight of your baby. The natural fibers of the 100% cotton fabric ‘breathes’ well. Secure: Your baby is secured by three sections of fabric for triple-wrapped security. 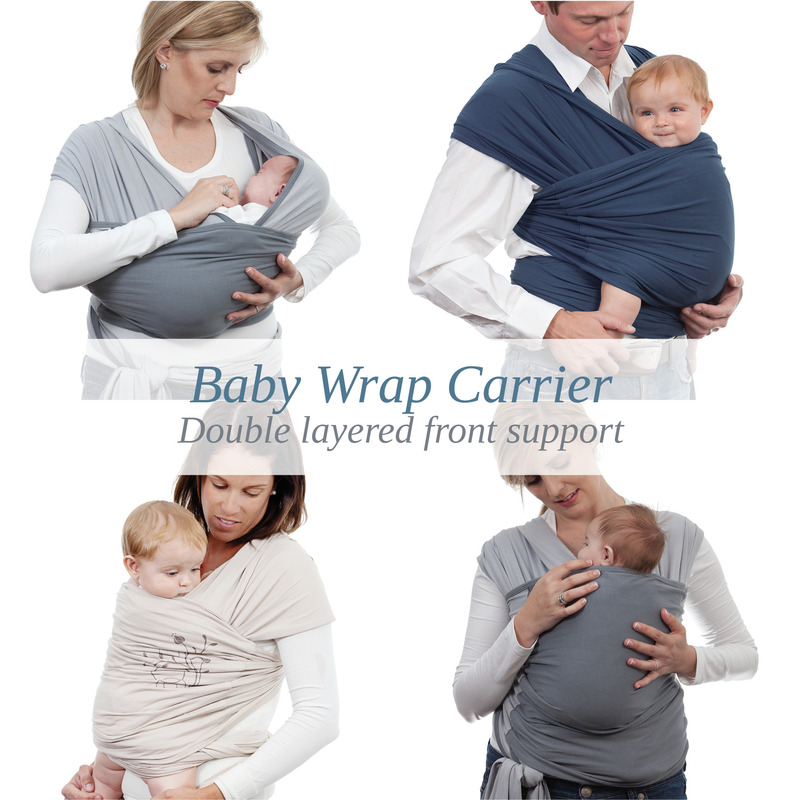 The Baby Wrap Carrier’s stretch and wide width also ensures that your baby is held close and kissable. When sleeping, the back of your baby’s head can also be secured under the cotton fabric (for added safety). Be uniquely close to your baby: Your baby can hear your heartbeat and find comfort in the touch of your body within the cuddly comfort of the Baby Wrap Carrier. Skin-to-skin: Skin-to-skin contact is used to promote parent/infant bonding, especially for premature babies. It is the practice of holding an infant dressed only in a nappy against a parent’s bare chest. Through contact with parent’s skin, babies experience better regulated temperature and lowered stress levels, among other essential benefits for newborns. Calm: There is overwhelming evidence that babies who are carried on their mothers are significantly calmer than babies who aren’t, and sleep better at night when carried during the day. 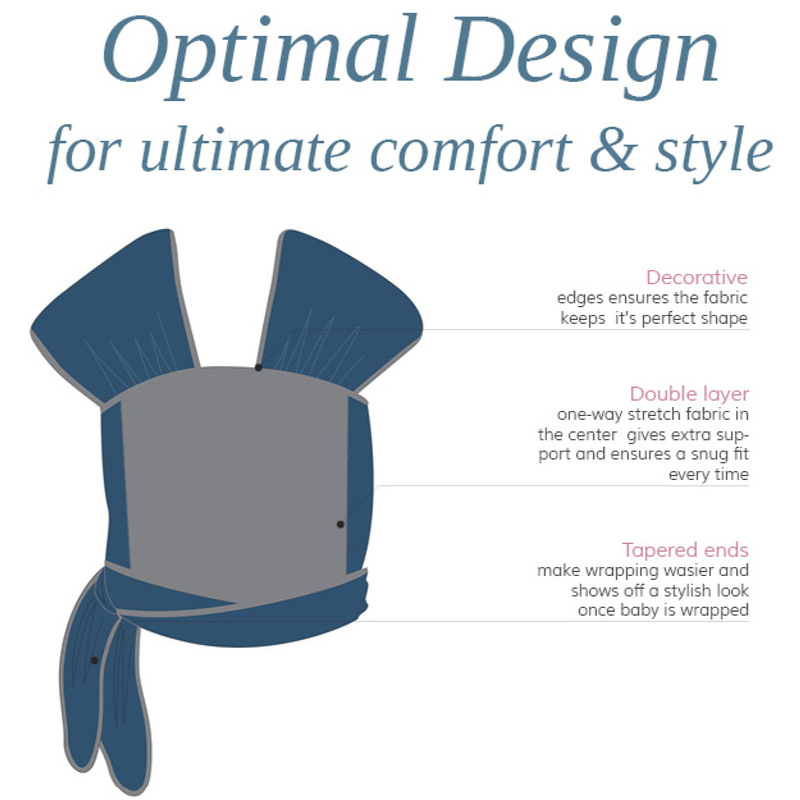 The Baby Wrap Carrier mimics the calming environment of the womb. The feeling of being rocked, the soft, snug feel of the Baby Wrap Carrier, and the sounds of your body (heartbeat & voice) help to calm your baby. Snug and close to you, your baby is in a familiar womb-like environment. Convenience: Carrying your baby, as well as being able to get on and do essential chores, or just go for a walk, is a balancing act. The Baby Wrap Carrier keeps your baby content while freeing up your hands to ‘get things done’. The convenience goes as far as allowing you to feed discreetly while wearing your baby. Open the Baby Wrap Carrier and find the front panel. Place the panel at the center of your waist and wrap the fabric around towards your back. Cross fabric over each shoulder, bring it up and over to the front. Try not to let the fabric twist. Don’t worry if the fabric bunches up. Pull the two pieces down so that the front panel begins to rise. 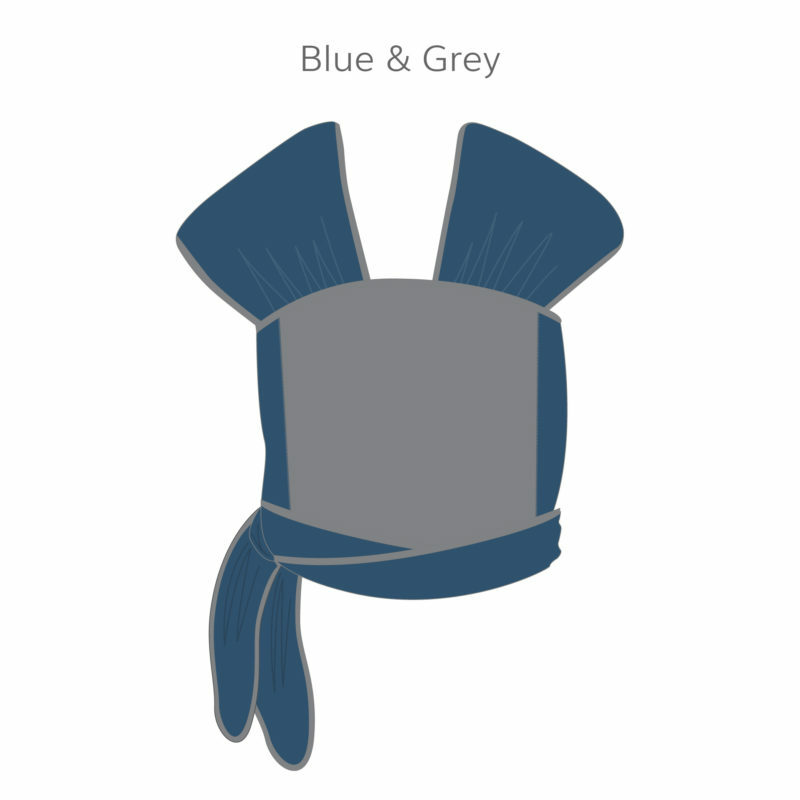 The fabric should fit snugly around your chest as it will stretch around your baby. Cross the pieces, bring them around your waist and behind your back. Remember, your baby is going to be positioned where the cross is. The fabric should fit snugly as it will stretch. You probably won’t get it right the first time. It takes some practice, but once you get it right, you will never want to carry your baby any other way. Baby should stay close to your body, and fit snugly in. Support baby with one hand and lean forward. Your Baby Wrap Carrier is too loose if baby moves away from your body. Bring front panel down to baby’s mid-back. 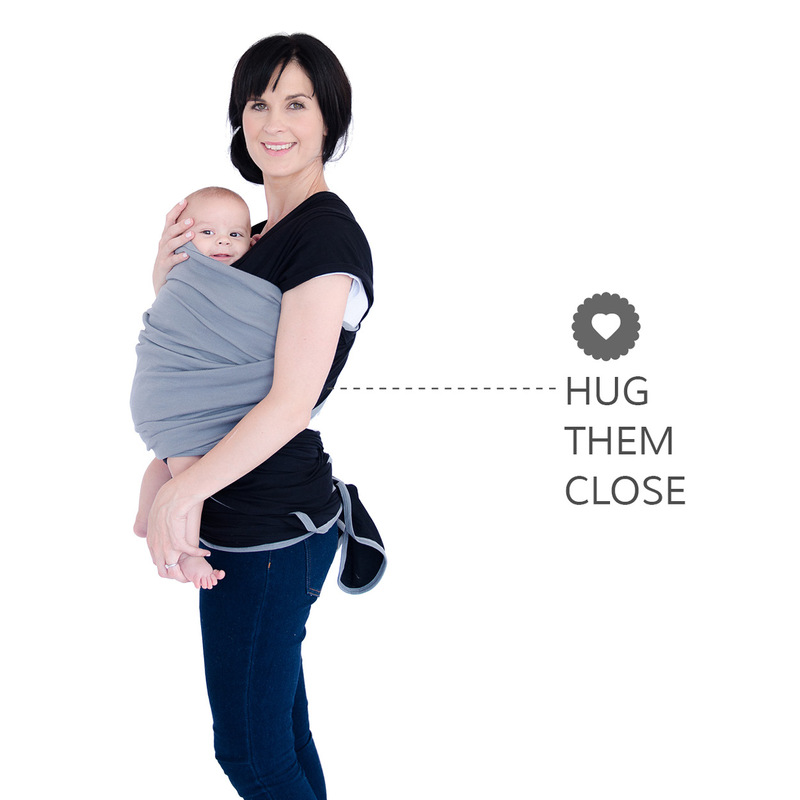 Insert your hands through side of Baby Wrap Carrier and adjust baby. If you can’t, baby is wrapped too tight. After checking that baby is wrapped correctly and you are happy that baby is safe and comfortable, pull the front panel back up to secure your baby’s shoulders. HINT: Keep your Baby Wrap Carrier on, and then baby can go back in when ready. Lower the front panel below baby’s bottom. Open fabric, carefully supporting baby as you do this. Newborns will need additional head support. Lift baby straight up and out of the Baby Wrap Carrier. Keep baby close to your body as you lift up. Fold your Baby Wrap Carrier in half when tying so that it makes a pouch for your baby. Place the baby in the pouch closest to your chest and spread the fabric over your baby. Place your baby’s feet in the opposite pouch and spread the fabric over your baby again. Pull the front panel up and over your baby. It is important that your baby’s head is resting in the pouch for neck support, but make sure his face is not fully covered. Pull the front panel up and over your baby’s body. Remember your baby’s face should be visible with the fabric providing support around the back and head as it will stretch around your baby. Place one of your baby’s leg through the piece of fabric that is closest to your body. Pull the front panel up and over your baby’s bottom and back. You can keep his legs covered or uncovered. Before you wrap, choose the hip on which you’d like to carry baby. Wrap so that the shoulder piece closest to your body is the side on which you will carry baby. Shift the Baby Wrap Carrier so that the front panel is moved from your front to your side. Place one of baby’s legs through the shoulder piece closest to your body, so that baby straddles your hip. Spread the fabric over baby’s bottom and shoulder. Bring baby’s other leg through the opposite shoulder piece. Fully spread the fabric, ensuring it is up to the hollows of baby’s knees and over baby’s entire back. Locate the front panel and gently put both of baby’s legs through this section. Pull fabric up over baby’s back and shoulders. Baby should be seated comfortably at your hip with baby’s shoulders secured by three layers of fabric and legs straddling you. The American Society for Testing and Materials recommends obtaining advice from a healthcare professional before using a baby carrier for pre-term babies or babies under 3.6kg. Examine your wrap before each use for wear and tear, including ripped seams or torn fabric. Do not use if there is any damage to the fabric. Check that baby is safely positioned in the wrap according to instructions for use. Check on the baby often. Ensure that the baby is periodically re-positioned. Failure to pay attention can lead to falls or failure to notice distress. If using the wrap while breastfeeding, always move the baby’s face away from the breast after feeding and then re-position baby upright. Never leave a baby in a baby carrier that is not being worn. Never use when balance or mobility is impaired because of exercise, drowsiness or medical conditions. Your balance may be adversely affected by your movement and that of your child. Never use the wrap while engaging in activities such as cooking and cleaning that involve a heat source or exposure to chemicals. Never wear the wrap while driving or being a passenger in a motor vehicle. Never place more than one child in a baby carrier. Never use more than one baby carrier at the same time. Never use the wrap in any body of water. Keep baby facing towards the caregiver. Never face a baby outwards before they have head control. Use only the positions that are appropriate for your baby’s age. For example: a newborn should only be carried in the newborn hold for appropriate neck support. Be mindful of your baby’s temperature, always ensuring he is comfortable. Provide support to your baby when bending down or leaning over, as your baby could fall if unsupported. Always ensure that the wrap is secured with a double knot. Preemies, low birth weight newborn’s, babies with an upper respiratory infection, low muscle tone, or GERD should be carried in an upright position and should NOT be held in a horizontal (cradle, hammock) position across the wearer’s chest. If you are practising kangaroo care, always place your baby in an upright position. 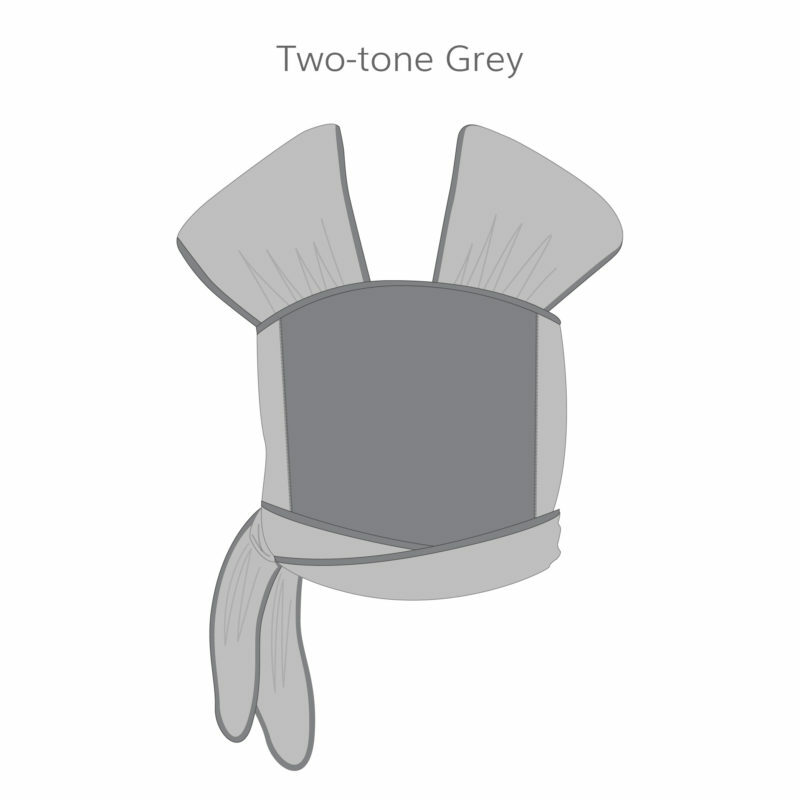 The horizontal position is not recommended for extended periods of time in the carrier, because having legs swaddled together is not ideal for hip development (especially in infants with pre-existing hip dysplasia). FALL HAZARD – Infants can fall through a wide leg opening or out of carrier. Before each use, make sure all fasteners are secure. Only use this carrier between 3.6kg/7.9lb and 13kg/28.7lb. SUFFOCATION HAZARD – Infants less than 4 months can suffocate in this product if face is pressed tight against your body. Do not strap infant too tight against your body. Keep infant’s face free from knots at all times. Never leave infant unattended in carrier. Ensure you can always see your infants face. 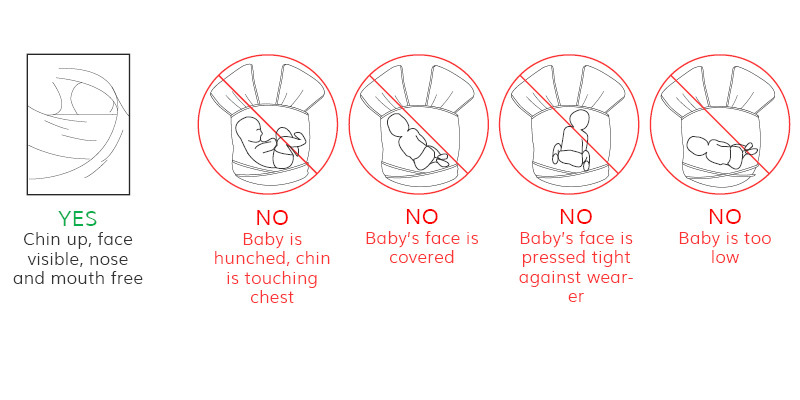 IMPORTANT: Infant must face towards you until he/she can hold head upright. Seek advice from a health care professional if uncertain. Read instructions for additional warnings and recommended guidelines. Keep packaging for future reference.